Round-up of Danny Sullivan’s, editor of Search Engine Land, tips for new online news organisations on SEO. Including: creating standing pages for popular ongoing stories and issues; and discovering relevant search terms and keywords linking to your site. 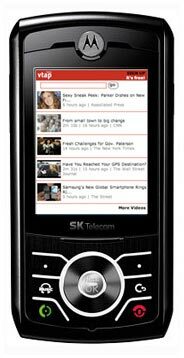 This entry was posted in Editors' pick, Search and tagged Danny Sullivan, editor, online news, online news organisations, search engine, search engine land, search terms, seo on May 22, 2009 by Laura Oliver. Spotted by Justin Williams – The Sun has purchased ‘Natasha Richardson’ as Google keywords, following the death of the actress. As raised when the Guardian mistakenly bought the search terms ‘Madeleine McCann’, how much is too much when it comes to search engine marketing? This entry was posted in Editors' pick, Press freedom and ethics, Search and tagged actress, google, Justin Williams, keywords, Natasha Richardson, search engine, search engine marketing, search terms, The Guardian, The Sun on March 19, 2009 by Laura Oliver. The Twitterfall of #twitterfall is the first non-mainstream media news source to appear on the screens, Warren said in a Tweet, adding that it’s the same size as the projection of Telegraph.co.uk on the screens and given more space than Sky, BBC and CNN on the wall. This entry was posted in Handy tools and technology and tagged BBC, CNN, editor, Marcus Warren, non-mainstream media news source, search terms, Telegraph.co.uk, the Telegraph, TwitPic, Twitter on February 25, 2009 by Laura Oliver. First up, the Financial Times has announced a new RSS service for corporate users – an add-on for those paying subscribers who signed up for the site’s direct licence system introduced in April last year. 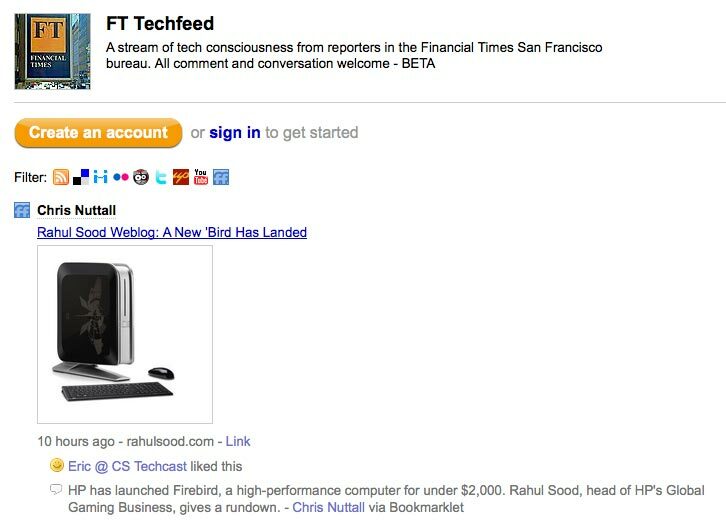 The customisable RSS feed will be available to corporate customers, who under the licence arrangement are entitled unlimited access to FT content on FT.com and third-party services, and can be tailored by specific search terms, a press release from the title said. Not full-fat feeds as yet – users will click through to read articles on the main website. This entry was posted in Social media and blogging and tagged Financial Times, Flickr, FriendFeed, ft, RSS, San Francisco, San Francisco bureau, search terms, technology journalists, The Financial Times, Twitter on January 6, 2009 by Laura Oliver. Mike O’Donnell, chief executive officer of iCopyright, gave Journalism.co.uk a sneak preview and an introduction to its new Discovery tool at the SIIA Global Information Industry Summit yesterday. The tool scans public sites, including blogs, for reuse of a publisher’s content. The publisher can specify the search terms, e.g. how much of a match, how important the offending site is in terms of ad revenue, and how the application will contact and deal with the infringer. A tool from iCopyright, which already handles copyright licensing for the Associated Press, is also being developed for bloggers and smaller, independent publishers, O’Donnell said. This entry was posted in Events and tagged Associated Press, chief executive officer, Copyright, copyright tracking tool, Discovery, Discovery tool, iCopyright, Journalism.co.uk, Mike O'Donnell, search terms, SIIA on September 11, 2008 by Laura Oliver. In our Innovations in Journalism series, Journalism.co.uk asks website and technology developers to pitch their projects to us. This time it’s Veveo with vtap, its personalised video service for mobiles. We’re Veveo – founded in 2004 by a team of executives with a history in multimedia, networking and mobile technologies. Veveo’s mission is to be a driving force behind the ‘video-anywhere revolution’. The company’s flagship product, vtap is the first significant proof of concept. It offers consumers an easy way to browse, discover, keep and share videos from any source on any imaginable topic on the mobile device(s) of their choosing. vtap indexes videos from all over the internet, including user-generated content (YouTube, DailyMotion) and professional sources (BBC, CNN), as well as blogs and corporate websites. Basically, anywhere that video appears on the internet vtap indexes it and it is searchable for users. To set up a personalised feed, users have to register (which is a simple process requiring only an email address and password). They then enter search terms, which will bring up results or topics. These ‘topics’ can then be added to a feed, which allows users to log in and view relevant content at any time. This can also be viewed on their mobile phone. By each video there is a ‘share’ button which enables users to send the video to another user, they just need to know the other person’s user name. vtap is a great way to keep up-to-date with news and current events in an easy-to-view format. Because content is pushed to you on any device, you can keep up-to-date wherever you are. vtap is under constant development by our research and development team in Bangalore so there will be additional features in the near future. We’re also working with mobile operators, mobile manufacturers, TV providers, consumer electronics manufacturers and content creators to deploy vtap solutions. Veveo believes that video content is the easiest way to get the content you want on a mobile, whether that’s news or entertainment. To do this Veveo believes that users should be able to easily search videos from all over the web, and save and share what they find to create a personal TV channel. This level of personalised service enables consumers to access the most relevant video content wherever they are, on any device. vtap is a free service. vtap will be funded by an advertising model, details of which are yet to be announced. This entry was posted in Uncategorized and tagged advertising model, Bangalore, BBC, cellular telephone, CNN, consumer electronics manufacturers, Innovations in Journalism, internet vtap, Journalism.co.uk, journalist, mobile device, personalised video search service vtap, search terms, technology developers, Veveo, Veveo's mission, Video, vtap, vtap solutions, YouTube on August 20, 2008 by Laura Oliver. Google’s tool can help online publishers tweak their content to maximize traffic from search engine users, says OJR. This entry was posted in Editors' pick and tagged addictive site, google, online publisher, online publishers, search engine, search engine users, search engines, search queries, search terms on March 25, 2008 by Oliver Luft. Hello. I’m Kristoffer Lassen. I’m the co-founder of Imooty. Imooty is an interactive compendium of news stories from across Europe. It provides direct access to the latest breaking media coverage from the most important newspapers and media organizations based in the European Union, Switzerland and Norway. Imooty makes it possible for users to compare and contrast vast amounts of information. 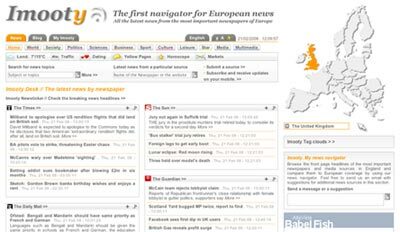 By clicking the European map, readers may browse through a particular country’s major and minor papers and blogs in English and local languages. One can easily search for a particular term across all European papers or simply navigate by the common news topics such as politics, science, or business. MyImooty allows users to create their own media universe. By collecting and saving the most frequently accessed news topics, you may collect your favourite sources on a single customized page. Each time you return to your page, the news is updated and sorted by subject, search terms and titles. The technical and conceptual goal of Imooty is not only to provide access to the latest breaking news, but also to enable a convenient way to review news archives. With its integrated search engine, users may find specific content located in several different databases and retrieve them through a single business transaction. We’re also in the process of adding Podcast and IPTV modules. I’m Norwegian and co-founder Blaise Bourgeois is French but we are both expats living in Germany. We are both interested in commentary and analysis of current events; however, keeping up to date on both the media landscape here in Berlin, as well as in our respective home countries was unmanageable. So we set out to create a platform that could solve this problem. We believe that as the European Union continues its development, more people will migrate and follow news and current events in different languages from nearby countries. Access to the latest news is free and we simply redirect traffic to the newspapers. As mentioned, also archived news will be searchable on the platform and such content will be displayed in the same format as the latest news (headline with a teaser text below it). Access to this information is a premium feature. Our business model is based on a combination of sales commission and advertising revenue. This entry was posted in Journalism, Multimedia, Newspapers, Online Journalism, Search and tagged advertising revenue, Berlin, Blaise Bourgeois, blogs, co-founder, Europe, European Union, Germany, Imooty, Innovations in Journalism, integrated search engine, journalist, media coverage, media organizations, media universe, Norway, search engine, search terms, Switzerland, the European on February 21, 2008 by Oliver Luft. Yahoo has combined its RSS feed of top news stories with a geo-encoding function of Yahoo Maps to create the Newsglobe (screenshot below). Fairly self-explanatory, it’s updated every few minutes and indicates the ranking of the news story by the size of the red bar plotting the story. This entry was posted in Online Journalism and tagged Geotagging, search terms, Yahoo on February 15, 2008 by Laura Oliver.